R-Truth and Carmella are already in the ring. R-Truth welcomes everyone to Truth TV. Truth and Carmella introduce their guest tonight, Daniel Bryan. Bryan heads to the ring. Truth puts on his glasses and begins reading questions for Bryan off some note cards. Truth asks Bryan how cathartic it would be to finally defeat The Miz and earn a title shot at the same time. Bryan begins to answer, but Carmella says “it’s time.” It’s time for a seven second dance break, so Truth and Carmella dance for seven seconds. They then sit back down and ask Bryan to continue answering his question. Bryan says he came back to in-ring action because he wants to be champ. He also has lots of unfinished business with The Miz, so yes, it would be very cathartic for Bryan to defeat The Miz. Bryan continues, but The Miz interrupts. Miz comes out to the stage and asks Truth what he’s doing. Truth says he beat Miz two weeks ago, so instead of winning a title, Truth just took Miz’s show. Miz thinks Truth is an idiot. He also thinks people love Daniel Bryan because he’s an underdog who always fights fair. Miz will do whatever it takes to win, and that’s why Bryan will never beat The Miz. Miz says the only way for Bryan to win is to cheat, but by doing so he will forever tarnish hos own name. R-Truth has heard enough. The Miz talked so long that it ruined Truth’s animal segment. Miz says it isn’t even Truth’s show, so Truth says he’ll fight Miz for it. Miz balks, but it’s time for another dance break. Truth and Carmella dance as Miz storms off backstage. Miz tells Paige he wants Truth TV canceled. Paige tells Miz that if he wants to shut down Truth’s show, he’ll have to fight for it. Miz protests, but Paige tells him to go. Miz reluctantly heads back out to the ring area. This was okay. I liked some of the moves R-Truth pulled off, but overall this was just okay. In the end the match wound up being about how The Miz will cheat to win. We didn’t really need a reminder of that, but it works as a step towards his match with Daniel Bryan at Super Show-Down. Earlier today, Charlotte was having a photo shoot when Becky Lynch attacked her. Becky had the photographer take her picture holding up the SD Women’s Title with one foot on the downed Charlotte Flair. Sheamus takes the mic from Big E. He says New Day might like to joke around, but The Bar just wants to fight. Cesaro says that at Super Show-Down, The Bar will shut New Day’s mouths. Good match even though it was short. There were some nice power exchanges and a few big moves. This was a decent preview for Super Show-Down. Paige tries to reason with AJ Styles. She doesn’t want him to go nuts and destroy everything when he comes face to face with Samoa Joe later tonight. Styles says the only thing he wants to destroy is Joe. Rusev tells Lana that Aiden English will pay for what he did. He just wants to know why he attacked him last week. Rusev and Lana head towards the ring area. Rusev and Lana head to the ring. Rusev is angry that Aiden English attacked him on Rusev Day. Aiden is a traitor, and Rusev wants answers. Aiden English comes out to the stage. English says it’s not his fault. None of this is his fault. He says no one cared about Rusev before Aiden helped him realize his full potential. To prove his point, English plays a video of people booing Rusev before Rusev Day, then cheering after Rusev started teaming with English. English continues by talking about people chanting “Rusev Day” throughout the entirety of Wrestlemania. So what happened? English says Lana happened. This whole mess is Lana’s fault. To prove his point, he shows another video, this of Lana being around when Rusev lost matches. English says things were better when Lana wasn’t around. Lana says she got Rusev a tank at Wrestlemania. She accuses English of using Rusev’s success to make a name for himself. Aiden says it’s true, Lana is great. And she’s always been honest with Rusev, right? But will she tell him about that night in Milwaukee? Lana starts yelling as English walks away. Naomi helps Asuka warm up for her match. Lana tells Rusev that she doesn’t know what English is talking about. Rusev wonders why English mentioned Milwaukee. Becky Lynch walks up. Lana wants Lynch to go away, so Lynch insults her before leaving. Rusev is still thinking about Milwaukee. This was good. A commercial break and the IIconics on commentary were distracting from a lot of the action, but I liked the match fine. The match was short, but it did an okay job of showing what Asuka and Naomi can do as a team. Shinsuke Nakamura prepares for a match. There wasn’t much to this match. It started quickly, but it also ended quickly. Dillinger was getting on a roll when Randy Orton attacked him, ending the match. After the match, Orton continues his attack on Dillinger. Dillinger is beaten up in and around the ring, and the beating stops when Orton hits Dillinger with a hanging DDT from the apron to the floor. Orton leaves, so Nakamura takes the opportunity to hit Dillinger with Kinshasa, smashing Dillinger’s head into the LED board on the side of the ring. Rusev wishes Lana luck in her upcoming match. Lana wonders why Rusev would believe anything Aiden English would say. Rusev says he doesn’t believe English, he’s just a little frustrated right now. Lana isn’t pleased with that answer. Mike Rome asks Randy Orton why he attacked Tye Dillinger. Orton says “that perfect ten crap” just pissed him off. This was another quick match, but I liked it for what it was. Kayla Braxton asks Aiden English to elaborate on what he said earlier. English refuses, but he says he will show video evidence next week. Paige talks to some security guards in preparation for the Styles/Joe face to face meeting. Paige is in the ring, ready to preside over the contract signing for Styles versus Joe. She explains that due to the finish of their last match, the next title match will have no disqualifications and no count outs. She then introduces AJ Styles who heads to the ring. Paige introduces Samoa Joe next, but Joe doesn’t come out. Styles isn’t surprised. He says Joe is more likely to attack him from behind than to come out for a face to face meeting. He also says the stipulations might be right up Joe’s alley since he never follows the rules anyway. 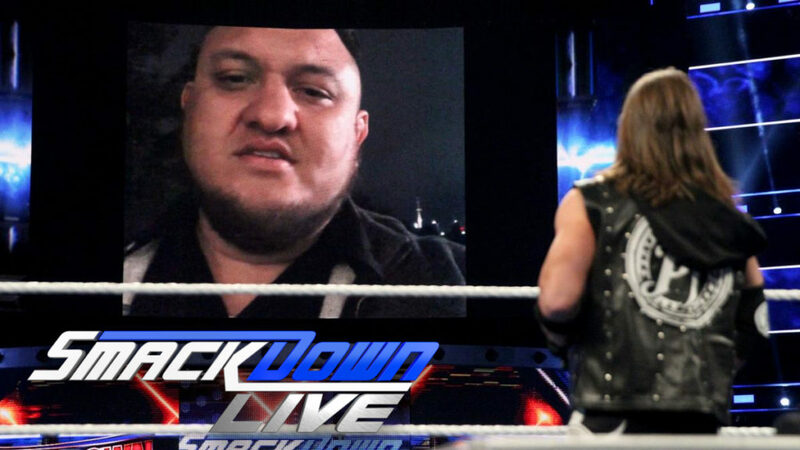 Samoa Joe then appears on the tron, interrupting Styles. Joe is standing outside Styles’ house. Joe looks smug as he takes a seat on Styles’ front porch. Joe talks about what Styles must be feeling. Helplessness, anger, and fear. Joe wants Styles to remember what he’s feeling, because that’s exactly what he will feel when Joe takes his title away. Joe rings the doorbell right before the show ends. I have to say, I’m not a fan of some of the stories going on right now. I haven’t been into the Joe/Styles story (even though the matches have been good up until the finishes), and I think home invasion angles are dumb. Joe didn’t necessarily invade Styles’ home, but it was close enough. And I’m not a fan of the cheating woman angle. It always just feels weird. I did like the Miz/R-Truth stuff, I like seeing R-Truth and Carmella together, the tag division is always great, and I like that Tye Dillinger might get some more screen time. I wish Nakamura could have some decent matches on TV, but at least he’s a champ (even if being a champ didn’t get him a spot on the last PPV). All of the other matches were too short to really amount to much, so this kind of wins by default.